DES MOINES, IA - There are some new sheriffs in the town known as the Indoor Football League, and they go by the moniker of Barnstormers. In a see-saw battle tonight, the Iowa Barnstormers earned the right to call themselves champions after they put away the Sioux Falls Storm in the 10th United Bowl (United Bowl X). Jamal Tyler's eight-yard run with 13 seconds to go proved to be the deciding score. It is the first championship for the Barnstormers in team history. The team, founded in 1995 in the Arena Football league, reached the ArenaBowl in 1996 and 1997 behind future National Football League Hall of Famer Kurt Warner, but did not capture a championship in either of those years. Last season, Iowa was eliminated in the United Conference Championship game as they fell to the Storm, 66-32. 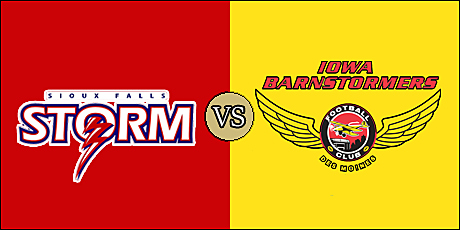 Since moving over from the AFL following the 2014 season, the Barnstormers had not defeated the Storm until their 49-42 victory in Sioux Falls in Week 11. Including last year's playoff game, and this United Bowl victory, Iowa has defeated Sioux Falls just twice in nine meetings. That said, tonight's championship is the biggest for the Barnstormers in this series and, perhaps, in the biggest win in franchise history. 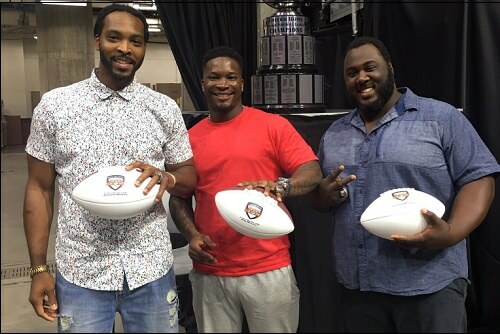 During the game, The IFL inducted three former players into its Hall of Fame. Nebraska Danger linebacker Cornelius "Pig" Brown, Danger quarterback Jameel Sewell and Sioux Fals Storm ofensive lineman Charlie Sanders entered the IFL's Hall after stellar careers in the league. Brown was named last week as the new head coach of the Danger. IFL Hall of Fame inductees Pig Brown, Jameel Sewell and Charlie Sanders. The Barnstormers earned their shot with an 11-3 record and 48-17 win over the Nebraska Danger in the United Conference Championship on June 22. The Storm punched the ticket to their ninth straight United Bowl berth by edging out the Arizona Rattlers in overtime, 69-68, on June 23. The Barnstormers struck first when quarterback Drew Powell found defensive lineman B.J. Butler for a six-yard touchdown. The duo attempted a similar play previously, but were unable to connect. Iowa led 7-0 at the end of one quarter. Sioux Falls evened the score on Lorenzo Brown's 11-yard touchdown scamper early in the second quarter. The Barnstormers immediately responded when Powell hit a wide open Ryan Balentine on a 42-yard touchdown bomb. Damond Powell's two-yard touchdown from Brown made the score 14-14 with 6:30 remaining in the first half. The Barnstormers went up by a touchdown when Drew Powell hit Balentine for a 23-yard score. Sioux Falls narrowed the score to 21-17 on Miles Bergner's 28-yard field goal with four seconds remaining in the half. Iowa led 21-17 at intermission. Sioux Falls took their first lead of the game when Brown ran it in from a yard out on the first drive of the second half. Iowa came right back, with Drew Powell rushing for a three-yard touchdown to cap a six-play, 45-yard drive. Brown's 11-yard rush up the middle for a touchdown gave the Storm a 31-28 lead which they held through the end of three quarters. Drew Powell found Ryan Balentine for four yards and the Barnstormers were up 35-31 six minutes into the final quarter. The Storm took the lead on another run from Brown, of three yards. That set up the Barnstormers' final drive, which they pushed deep past the one-minute warning. Tyler's go-ahead touchdown run sealed it for the Barnstormers. The Barmstormers produced 250 yards of total offense, with 157 of those yards coming in the passing game. They rushed for 83 yards. The Storm had 238 yards offensively. They had 134 passing yards and 104 rushing yards. The only turnover of the game came on Brown's interception in the first quarter. Iowa was penalized eight times for 53 yards, and Sioux Falls was flagged five times for 39 yards. Drew Powell completed 12 of 16 passes for 178 yards and a quartet of touchdowns. He rushed 13 times for 48 yards and another score. Ryan Balentine, who was named Most Valuable Player for the game, caught 5 passes for 91 yards and three touchdowns. Brady Roland has two receptions for 46 yards. Jourdan Wickliffe was spectacular on the defensive side for the Barnstormers, tallying nine total tackles and an interception. Brown went 15 of 24 for 134 yards with an touchdown and an interception. He rushed 16 times for 84 yards and four scores. Damien Ford caught eight passes for 59 yards, while Damond Powell had five catches for 40 yards and a touchdown. Jabari Gorman led the Storm defense with 6.5 total tackles. Lorenzo White Jr. recoded a sack. The game was played in front of a raucous crowd at Wells Fargo Arena in Des Moines. Tremendous win for the Barnstormers and city of Des Moines. I had wondered if Sioux Falls settling for a field goal at the end of the first half would have an effect on the outcome, and it was exactly that. This back-and-forth style of game is definitely championship worthy. I really enjoyed this one. The Barnstormers earned this win the hard way. They met every challenge and never backed down. The team deserves a whole lot of credit for this championship. You could tell by watching this that the crowd was huge and really into this game. The team did not let them down. Congratulations to the IFL champion Iowa Barnstormers!